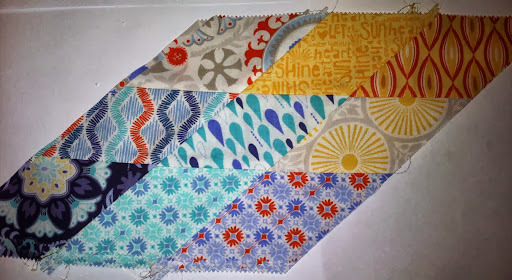 This weekend I am working on my Kate Spain Sunnyside jelly roll. 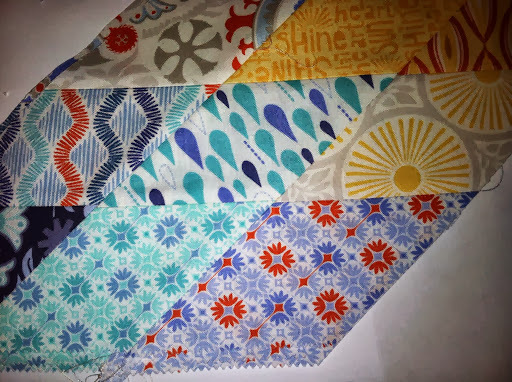 I usually don't buy precuts but I have to say they are a timesaver and if you are not sure about the fabric line it's a great way to see all the prints a line has to offer. I do have to admit I love, love, love the color pallet and am going to be real jealous of the recipient of this quilt. I do have to have it done by early dec for shipping to one of my favorite girls. This quilt features a chevron of diamonds and is super cool!! Matching the points is definitely challenging but will be well worth the effort. Here is the first color way diamond. I just bought a charm pack of this line... I look forward to seeing more of your top! Looking good! Can't wait to see more. I love that line! Kate Spain is my favorite! I always love her colors and design. Can't wait to see more of this project! Looks great so far!